Real Archaeology, Inc. | SPACE-BIFF! There’s something jarring about Artifacts, Inc. And yes, I’m talking about how it feels downright peculiar to play a game about archaeology during the interwar period and not be pitted against the Nazi Paranormal Research Division in a hunt over land, air, and sea for the Spear of Destiny, where “Roll a d6 to keep your eyes pressed shut,” is the final challenge. Instead, Artifacts, Inc. is an entirely pleasant game, one where rival antiquarians might occasionally become kind of snitty with each other, but otherwise behave and don’t go exploding or stealing each other’s stuff. Surprisingly, this works way better than it has any right to. Like many of Ryan Laukat’s games, Artifacts, Inc. is very much doing its own thing. It’s a worker placement game, but you’ll spend all your workers on your turn and never once block anyone out of a space. It’s a dice-rolling game, but those dice just become your workers instead of making aggressive overtures. It’s a tableau-building and economic game, but in a way that feels entirely different from everything else out there. The basics are pretty straightforward. On your turn you roll a number of dice, representing your adventuring company’s employees. Then you use them to perform a chain of simple actions. Maybe you buy a new asset or go on an expedition to find artifacts. If you rolled poorly, you can send your wimpy dice off to do guide work for petty cash or visit a museum to unload your discoveries. It’s a cool system. There are always things to do, whether mounting increasingly difficult undersea dives for precious artifacts or making nice with tour agencies and colleges to increase the value of certain finds. Ironically, the very thing that makes each turn so interesting is what saddles the game with its greatest weakness. 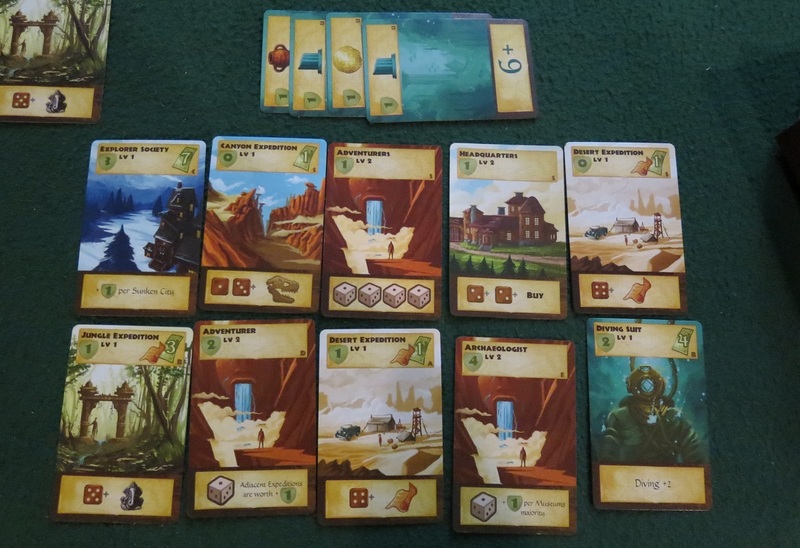 A single round might see you going on an expedition to dig up some fossils, selling them and a bunch of gems to private collectors for a wad of cash, using that cash and a map to upgrade your jungle expedition, and then heading out on that expedition and finding some rare statues. Pulling off a turn like this is much like delving into the undiscovered depths of the jungle — a singular thrill! — but it does mean that planning ahead can be tough. 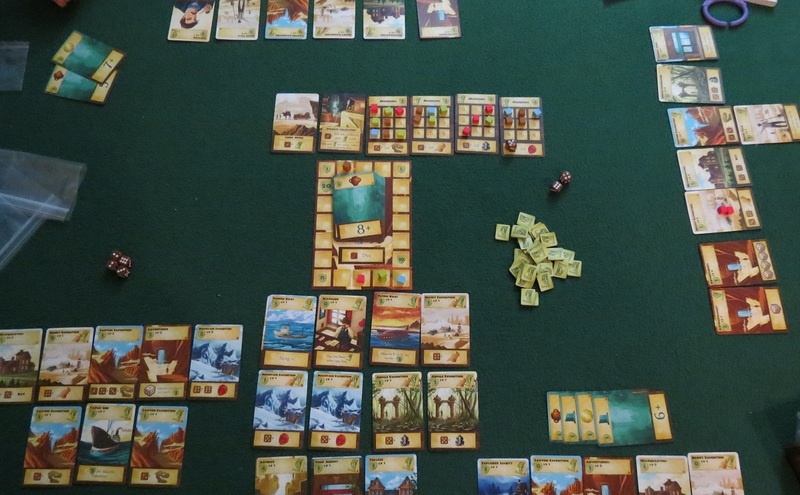 Dice are rolled anew at the start of each turn and previous adventurers may well have occupied the museum slot you desired or gobbled up one or more of the cards you were considering purchasing. Consequently, turns can drag on a bit, especially when playing with three or four. Museums get to be a bit stingy by the end. It’s a tricky problem, confounding because the game is so much fun otherwise. The cards for sale in the market highlight this, giving you all sorts of advantages. Sick of not earning the dough you deserve from those stingy museums? Hire a curator to earn a bit extra! Want to spend more time underwater without wasting all your dice? Invest in a fishing boat or diving suit! Feel like luck is giving you mosquito-kisses on the haunches? Use a truck or digger team to control your odds! There are better expeditions to uncover, new adventurers to recruit, and adjacency bonuses to exploit. At its best, there are many avenues to becoming the most famous team of archaeologists in history. Even cooler, all the cards are double-sided, becoming better versions of themselves if you’re willing to invest. A company manager can make everything a little more affordable, but an upgraded manager? Baby, you’re hardly paying for anything at that point. Then your turn ends and you’ve got a long wait ahead of you. It would be a little better if there were any form of player interaction beyond snatching up desirable cards and museum contracts. Perhaps an auction or something. I don’t know. As is, you take these awesome turns, get rich or famous or both, feel brilliant, and then take a nap long enough to enter REM sleep. For such a small game, it can sprawl with more players. The thing is, I really dig Artifacts, Inc. It’s a smart game, it blends a bunch of different concepts into a genre smoothie, it’s gorgeous to look at, and it doesn’t feel like anything else out there. Like many of Ryan Laukat’s games, it’s tightly designed and doesn’t shoehorn you into a single strategy. Assembling a functioning system that can simultaneously rake in the dough and garner fame is a challenge, but a pleasurable one. But be warned: for those short on patience, here be dragons. Sleeping dragons. Glassy-eyed, bored, unfocused, sleeping dragons. It’s a little like real archaeology: tedium punctuated by sudden excitement. At least that’s the case with too many players. As for me, I’ll be playing it with just two. Its brightest bits shine through most brilliantly that way. Posted on August 12, 2015, in Board Game and tagged Artifacts Inc., Board Games, GenCon Loot, Red Raven Games, Ryan Laukat, The Fruits of Kickstarter. Bookmark the permalink. 3 Comments.